1.From nature, I used a bird on a branch stamp and added a twig and some seeds from a pine cone. 2. I used a corner punch. 3. I used a green base card and a green mat. 4. Background of my image is mat cut with scalloped square nestie. Little Red Wagon: Use the color red. Congrats to them on one year of challenges. The Pixie Cottage: Challenge is to recycle...used the twigs and pine nut seeds and scraps of plaid paper. 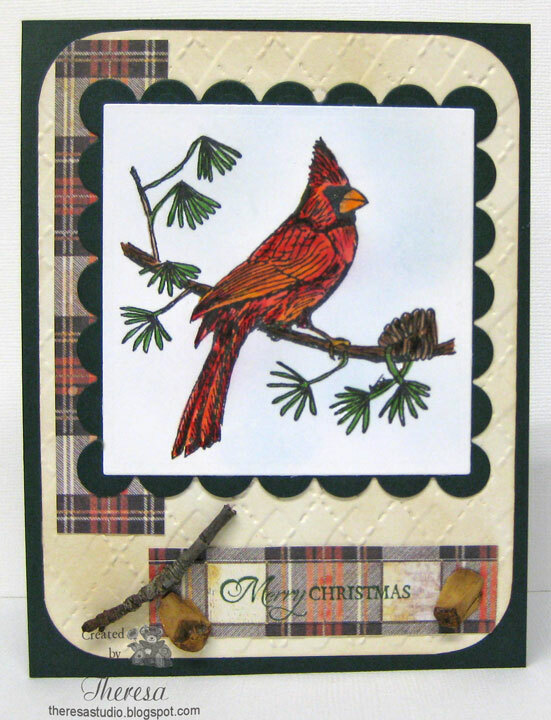 Plan to do their sketch challenge later, but wanted to use this beautiful Cardinal that I won at The pixie Cottage. Wee Memories Challenge: Free for all-anything goes. Lollipop Crafts: Use embossing. Used Cuttlebug EF Argyle on distresses mat. Secret Crafter Saturday Challenges: Anything that flies. Theresa, your card is gorgeous. I just love the natural things you used from nature. Great cardinal too. Thanks so much for playing in Joan's Gardens #21 Weekly Challenge. I just love all the ideas! That is a lovely card. I didn't expect twigs and pine nut seeds on a card, it is original. Thanks for joining The Pixie Cottage Challenge from this week. Great card, your colouring of the cardinal bird is awesome. OMGosh... how do you do it? This is stunning... love the cardinal! Such a beautiful card! I love the addition of the twig! Thanks for playing along with LRW! Theresa! Love how you've coloured this image. Great card! Thanks for joining us at Craft Your Passion. what a beauty!!! you mastered the Copics - red is tough and this is wonnnn-derful! Great recycling!! Lovely card with all the interesting elements. Thanks for joining us at the Pixie Cottage. Theresa, Lovely card, so happy to see you using your "prize"
Wow!! what a fabulous card, I love the colouring of the Cardinal and the use of the twig is a fantastic idea. Thank you so much for joining us at The Pixie Cottage this week. I love how you incorporated twigs on your card. 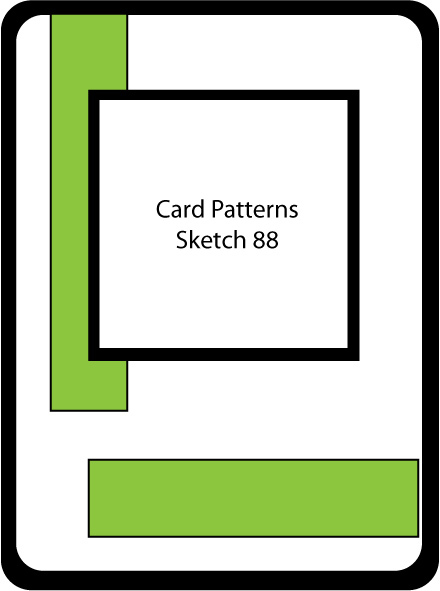 Thanks for playing with us at Card Patterns. Marvelous creation!!! 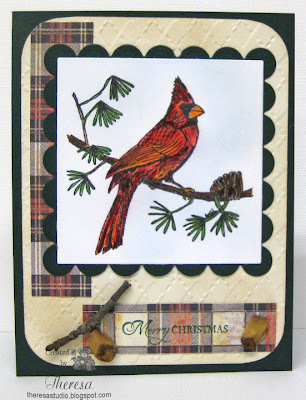 the cardinal is a great image to use and i love how your embossing is subtle! Thank you for joining us at Lolipop Crafts! thank you for using my cardinal bird- your card is wonderful. i love the natural elements! thank you for sharing at the pixie cottage!